Services that provide a private chat room-like experience for mobile users are creating lots of buzz at South by Southwest, the Austin, Texas technology, film and music festival. NEW YORK ( TheStreet) -- As they have for the past few years, technology start-ups are battling it out to become the next big thing in Austin, Texas this week, at the city's infamous South by Southwest conference. 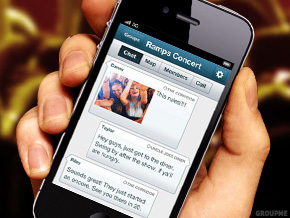 Emerging as early favorites: group texting apps. Several of these texting apps, which make it easier for multiple people to chat and connect in real-time via text message, debuted or launched big updates just before the conference, a gathering of music, film and technology insiders. While tech giants like Apple ( AAPL - Get Report) and Google ( GOOG - Get Report) maintain a presence at South by Southwest -- the iPad maker opened a pop-up store in downtown Austin to coincide with the event, while Google VPs and engineers are speaking at various sessions during the week -- the festival is better known as a launch pad for fledgling companies like Foursquare and Twitter. And like these two well-known social networking services, group texting companies hope to capitalize on the popularity of mobile applications while putting a new spin on an old technology. Group texting apps are designed for a wide user base, for folks setting up small gatherings like study sessions to people meeting up at larger events like concerts and music festivals. GroupMe, a New York City upstart, is considered the darling among group texting apps. Earlier this month, the app launched several new social features that let users upload photos and disclose their location. The group texting space has become popular as people look for ways to share private information with select groups of friends, rather than broadcasting their conversations on a public platform like Facebook, said GroupMe co-founder Jared Hecht. "People want to feel comfortable sharing things with groups of people in their lives and expressing themselves freely," he said. GroupMe is not the only player in the group texting space. Dozens of competitors have launched, including Fast Society, Kik Messenger, PingChat and Beluga. "The group messaging space is like being in high school when a pretty girl comes along and everyone wants to talk to her," said Fast Society co-founder Matthew Rosenberg, in explaining the flood of companies that have developed in the sector. At South by Southwest, group messaging apps are hoping to rise above the noise and attract users and media with flashy marketing tactics. Fast Society offered free shuttle rides to downtown from Austin's airport and also sponsored a Patron tequila-fueled house party Sunday night. GroupMe gave away grilled cheese sandwiches with the company's logo branded onto the bread. While group texting apps hope their services will soon become mainstream, investors are already keen on their technology. In January, GroupMe closed a $10.6 million venture round from investors like General Catalyst Partners, First Round Capital and Lerer Ventures. Kik, which raised $8 million last week, also announced that it had added well-known investor Fred Wilson from Union Square Ventures to its board of directors. The opportunity in the group texting space is "enormous," said Mark Suster, a partner at GRP Partners, who has invested in GOGII, the maker of group messaging service TextPlus. "We know these trends will continue -- computing will continue to be mobile and people will want to connect with other human beings." Large companies are also looking to capitalize on the buzz surrounding group texting technology: Facebook announced earlier this month that it bought Beluga, a Silicon Valley firm whose app is available for iOS and Android phones. Research In Motion ( RIMM is also reportedly exploring bringing its beloved BlackBerry Messenger instant messenger client to Apple and Android devices. But while group texting apps are generating huge hype and have started to gain some traction -- GroupMe says its users are sending more than a million texts a day -- most aren't yet generating revenue. GroupMe says it is experimenting with offering users coupons, which are targeted based on key words in texts, and Fast Society is looking into creating branded groups that are hosted by a corporate sponsor. Although texting is considered low-tech in an age when many consumers have mobile e-mail and instant messaging at their fingertips, it continues to surge in popularity. More than 10 trillion messages are expected to be sent in 2013, up from 6.1 trillion messages last year, according to the International Telecommunication Union. And for consumers with low-tech feature phones -- the majority of mobile users today, according to Comscore -- it's the only form of written messages they can receive. "In a world of smartphones and phones of all different capabilities, group text messaging is super simple," said Charlie O'Donnell, a principal with First Round Capital and an investor in GroupMe. "What wins out is the technology with the least barriers to friction." Group messaging might be this year's most hyped trend at South by Southwest, but other mobile apps are expected to create buzz, too. Among them: picture-sharing services like Instagram, Picplz and Path. Also anticipated to attract attention: smartphone apps that allow people to make connections on-the-go like Hashable, which is designed to exchange business card information over Twitter, and Bump, which lets users share contact information by bumping their phones together.